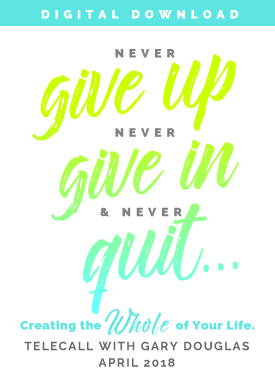 Welcome to Never Give Up, Never Give In & Never Quit...Creating the Whole of Your Life! If nothing could stop you, what could you create? What is Never Give Up, Never Quit & Never Give In? This 3-part telecall with Gary Douglas will empower you to know that you can create anything you desire and give you the tools to get this reality to work for you. The ultimate manipulation is to ask a question.